XI'AN - The Penthern tiger (South China Tiger), a species unique to China, has reappeared in the wild after a gap of two decades in the Qinling Mountains of Northwest China's Shaanxi Province. "We made a breakthrough after more than one year of investigation," said Zhu Julong, deputy director of Shaanxi Forestry Administration Bureau, on Friday in Xi'an, the capital of Shaanxi Province. According to Zhu, Zhou Zhenglong, a farmer in Wencai, a village in Zhenping County, took photos of the animal on the mountain on October 3. "After the careful examination, experts confirmed the authenticity of the photos," he said. "That means the tiger has been found again after more than 20 years." In recent years, the provincial forestry bureau received a number of reports from local farmers saying that they saw big animals like tigers living in the mountains near their villages, prompting the bureau to launch its investigation in June 2006, said Zhu. "After two stages of the investigation, we found the tigers' pawprints, feces, hair, teeth, paw marks on tree trunks and other important evidence on the mountains," said Lu Xirong, deputy director of Shaanxi Wild Animal Management Station and head of the investigation team. On July 6, the provincial forestry bureau held a working conference in which experts, after careful analysis and screening, initially determined that the Penthern tiger still lives in the mountainous area. 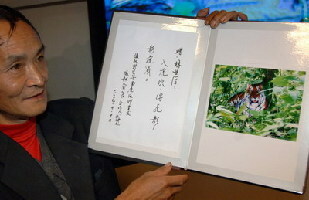 "The pictures of the tiger taken by Zhou Zhenglong confirmed the existence of the animal in the area," Lu said. "I also found a tiger's cave and some paw marks near the place where I took the pictures," said Zhou. The South China tiger was listed as one of 10 highly endangered species in 1996 by the International Natural Conservation Alliance. At present, there are only 68 such tigers living in 18 zoos in China. "The mountainous area in Zhenping County has very good conditions including a well-protected forest and rich resources, and we will take measures to further protect both the animal and its living environment," said Zhu.